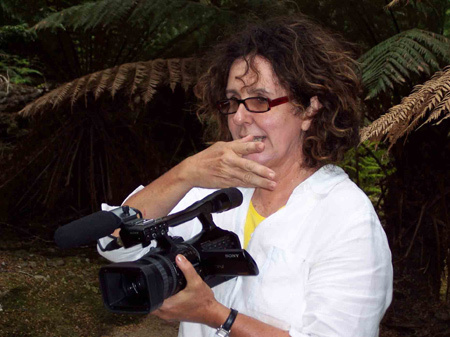 Merilyn Fairskye is a Sydney-based artist whose artwork encompasses a broad range of media and methods from public artwork to video installations, films and photo-based works. Her art videos have been screened in film and video festivals around the world including the International Film Festival Rotterdam (five times); Videobrasil; Oberhausen; Kassel; Sydney Film Festival and in art museums including the Tate Modern London; the Stedelijk Museum, Amsterdam. The Museum of Contemporary Art, Sydney and the National Palace Museum, Taipei. Until July 2014 she was Associate Professor at Sydney College of the Arts, University of Sydney. To see more works, visit www.plusandminus.net. Precarious is a haunting evocation of the aftermath of the explosion at Chernobyl, 25 years on. This visually stunning road movie takes the spectator on a bleak journey from the shores of the Black Sea to the frozen heart of Chernobyl, passing through desolate, snowy landscapes, littered with abandoned villages. Squatting in this icy wasteland, the ghostly sarcophagus of Reactor Number 4 is a constant reminder of the threat still lurking below. While winter exerts its hold, ice keeps the hidden radiation at bay, but the spring thaw will once again release the surrounding rivers' toxic flow. Accompanied by testimony from a group of unseen veterans of the disaster, Precarious bears witness to both the folly and resilience of humans and to nature's fragility. The Screening Room series, 8 November 2011, Cellblock Theatre, National Arts School, Sydney. Screening: 5 May 2011 Parliament House Melbourne.